Does the camera look familiar? Note how the non AF pixels are also multiples. Variations of this approach have been tried by numerous manufacturers, going back to Fuji nearly 10 years ago. Designing the pixels is one thing, making all the rest of the circuitry to process the information for every pixel has been slower to appear. There’s enough confirmation coming from different regions to say quite clearly that Samsung is getting out of the camera market. Samsung have enough other business activities to not worry too much about such a relatively small market . The same thing is distinctly less so with several of the camera makers. 19th A general ‘state of the rumours’ note… See the latest timeline below. 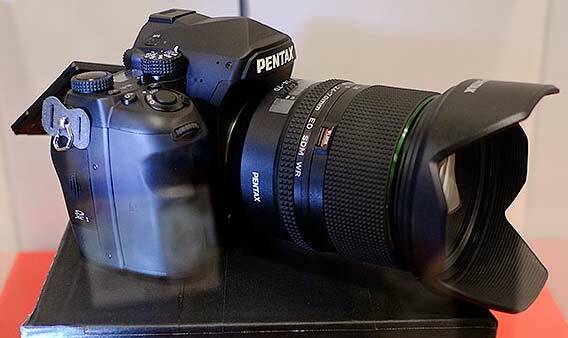 The only cameras I keep hearing of are the replacements for the 1D X and 5D3. 6D and 100D replacements are a good bet for 2016, but don’t expect a 6D mk2 until all remaining 5D3 stocks have been cleared and 5D4 sales have had a good run. 70D replacement? maybe a 70Da, but unless Canon see a real need to introduce some new technology, an 80D is an outside bet for later next year. EOS-M4 and a more pro version? Large printers – more new ones likely from Epson and Canon, but it looks as if the only 17″ from Canon will be the PRO-1000 (iPF5100 passed over again). 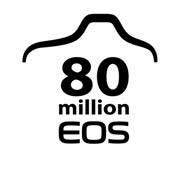 18th Canon have announced that EOS camera production has just passed the 80 million mark. “United Kingdom, Republic of Ireland, 18 November 2015 – Canon Inc. today announces it has reached a new camera-manufacturing milestone as combined production of its film and digital EOS-series interchangeable-lens cameras surpassed the 80-million mark on November 10, 2015. The 80-millionth EOS camera produced was an EOS 5DS R, which boasts the world’s highest pixel count in its class. 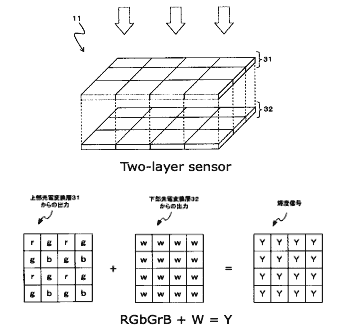 A patent from Panasonic [EG via Google xlt] covers the arrangement of coloured filters in the filter array of a sensor to optimise demosaicing and colour accuracy. 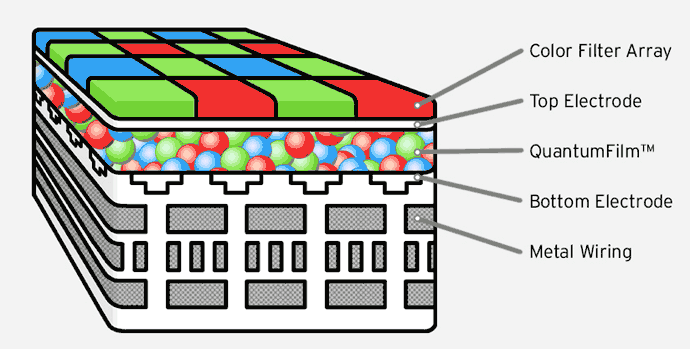 Ignore the repeated mention of Foveon in the translation – this is about getting better results from a single layer sensor and like all schemes is a matter of trading off different aspects of performance. I mention it because it gives a good feel for the issues facing all of the camera industry, not just Nikon. The figures were jumped on by many a site, at the time, as a sign of a turnaround – not how I saw it, but I wanted to hear what someone with a lot more experience of picking the numbers apart had to say. What happens when you ask six photographers to take a few portrait shots of the same person. 31st A bit of further analysis of camera numbers doesn’t seem to offer much to suggest that the decline is over. 29th With vague ‘full frame mirrorless’ and ‘two types of 5D4’ rumours doing the rounds, it looks as if the lack of significant cameras and Canon’s financials have stirred the pot, with a combination of ‘what everyone expects’ (5D3 replacement) and ‘what people want’ (full frame mirrorless). 26th Slow day in rumourland? Along with several of the rumour sites, I was sent info about Canon testing other manufacturers’ sensors in DSLRs. Apart from the fact that I’d expect them to be doing this quite often anyway, it doesn’t fit well with a company currently showcasing its own 250MP sensor around the world, and showing off other technology developments. They do already use Sony sensors in some of the small cameras. 23rd Looks like the PRO-1000 printer was the only big announcement timed for the Photo Plus show in NYC. Big camera shows just don’t have the reach or importance they did 10 years ago. They are not cheap to exhibit at and more companies are taking a serious look at whether they are worth the cost. Mainly just updates for newer kit. 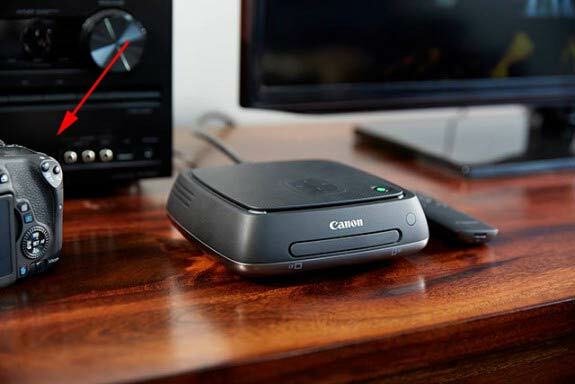 21st The Canon Pro1000 17″ desktop printer is announced in the US. The second used graded refractive index changes to ‘steer’ light to different sensing areas. 16th Important new FAA regulations regarding Lithium batteries mean that you can no longer pack spares (i.e. not in equipment) in checked luggage. For more details see the notes on our Canon battery page. A key techy feature is the ability to fine tune the amount of low pass filter applied and even bracket it. 1st In a firmware update I applaud, even if I wonder just how many people saw the problem, Canon address exposure issues for those using the TS-E17 and TS-E24 tilt shift lenses. “Fixes a phenomenon in which the captured image may exhibit uneven exposure when the camera is used with a TS-E 17mm f/4L or TS-E 24mm f/3.5L II lens which is shifted or tilted during shooting.” 1200D/T5 page. It’s normal practice to do any metering with the lens unshifted – perhaps this is a video thing? 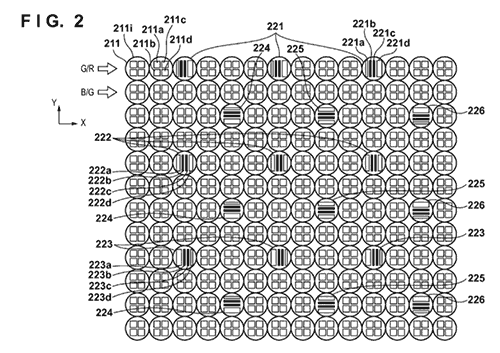 28th A Canon patent [EG via Google xlt] seems to refer to an improved sensor based AF system where phase AF pixels are augmented with some aspects of ‘light field’ processing. Look for numerous images of lines and boxes in posts that don’t actually tell you anything. Is Sony looking to quietly let the A mount wither? I’m rewriting the entire site and was re-arranging the Sony rumours section (true, never a big section) and noticed that we’ve not seen anything in that area for quite some time. It seems that E mount is (currently) the way they want to go? That said, the new uncompressed RAW files can make a significant difference to some types of image [DPR] I just wonder why such an obvious improvement was ignored for so long? – Look for a new line of high-end inkjet printers from Canon very soon. This removes one of my longstanding issues with the small Sony bodies – it remains to be seen just how many existing cameras this is rolled out to. 14th I notice that to add to the assorted piffle that normally goes round, the ‘Canon is buying Sigma’ rumour has been doing the rounds again. 13th The 120MP monster is a good couple of years away [CR] and no decision has been made about the body for it. That’s 422MP on a 35mm full frame sensor. 4th Those new large format printers from Epson should be announced in the next 2-3 weeks. No details yet, but the 7900/9900 (and maybe 4900) look ready for ‘SureColor’ versions. September 3rd There should be quite a bit of movement in the printer market in the next few months. Meanwhile there is talk [CR] of updates for the Pixma line being announced in October, including (at last) something at 17″ (the only Canon 17″ printer is the iPF5100, that’s getting on a bit). I note too that the Canon iPFx400 range are seeing appreciable discounting at the moment, perhaps a sign of something from Canon to go up against the larger SureColor printers from Epson? See the Canon Printers and Epson Printers rumours pages for all latest printer rumours and news. I’ve animated the diagram from the patent to give a better idea of how it works. Who EISA? A bit of a remnant of the past, representing some of the traditional dead tree media in photography, audio and related mens hobbies. Such awards recognise technical excellence and have nothing at all to do with the ongoing commitment to advertising, by large brands, on their pages. Whilst the 1Dx replacement (announcement) is likely in the next month or two, I’m not expecting to actually see a 6D2 this year, and I’d give a fair chance of the 5D 4 as being something that won’t ship this year either. 5D3 and 5Ds/R sales are too good at the moment. Not one I’d suggest following too closely … we used to see this sort of stuff all the time. 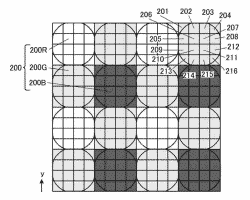 The patent seems to be addressing more complex pixel based phase and contrast AF. 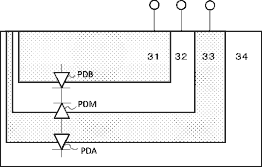 It also mentions using contrast and phase information together for focus microadjustment. Given that Canon hasn’t yet managed to provide any automation of AF adjustment, nor even a true ETTR exposure mode, there are plenty of advances still that don’t need whizzy new sensor technology to make for more useful cameras. 9th Expect considerable forum noise as the DxOmark results for the 5Ds and 5DsR are published. “MELVILLE, N.Y., July 8, 2015 – Canon U.S.A. Inc., a leader in digital imaging solutions, today announced the new Canon Speedlite 430EX III-RT external flash unit featuring – for the first time in the Canon 430EX series – radio-controlled wireless flash shooting capabilities1 designed to make creative light control more manageable and versatile for photographers of all levels. This third generation Speedlite is a perfect primary flash unit for amateur and advanced amateur photographers looking to create beautiful portraits with Canon digital cameras such as the EOS Rebel T6i, as well as professional photographers looking for a small and lightweight secondary flash. 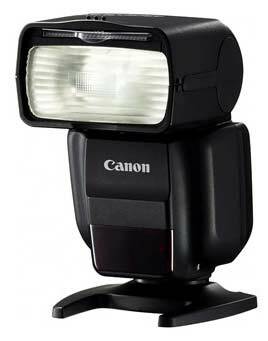 Featuring enhanced functionality and operability over its predecessor (the Canon Speedlite 430EX II), the new Canon Speedlite 430EX III-RT features wireless flash shooting via optical or radio transmission (similar to the Canon Speedlite 600EX-RT but slave function only), now with shorter recycling time and quicker firing. This multi-functional flash unit makes more advanced flash shooting easy for any photographer with its intuitive, user-friendly operation, abundant bounce and swivel shooting functions and advanced features including a maximum Guide Number of 43/141 at ISO 100 in meters/feet, auto zooming from 24-105mm, Hi-Speed Sync and Second-curtain Sync. In addition, the Speedlite 430EX III-RT has been reduced in size and weight compared to its predecessor. 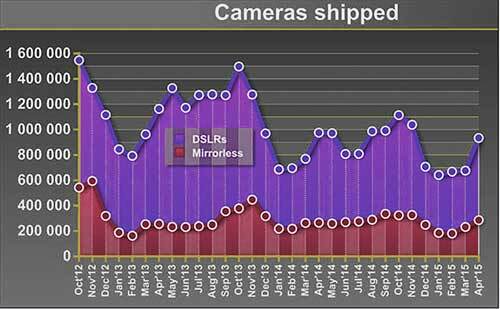 6th The numbers are out and the camera shipments continue to decline. See Thom Hogan‘s usual realistic commentary. One useful takeaway from his analysis is that if you can wait for a new camera, then do so, since prices are unlikely to start rising. I was also reminded that I forgot the successor to the 100D in my possible cameras yesterday. See the Canon timeline further down the page for a guide to what’s old. 5th We’ve been told (thanks) that Canon’s next announcement will be on August 14th and include a camera and two lenses. Probably to early for a 5D4 and 6D2, so perhaps the 1D x mk2? Taxis and photography – how the Uber model could spread? The actual anniversary isn’t until September. The 5D quashed 3D rumours in 2005, much like the 5D2 did in 2008 and the 5Ds did earlier this year. An unusual lens adapter patent (lenses page) include an option for full frame mirrorless from Canon. OK, not quite that bad, but the D300 replacement seems somewhat less imminent. 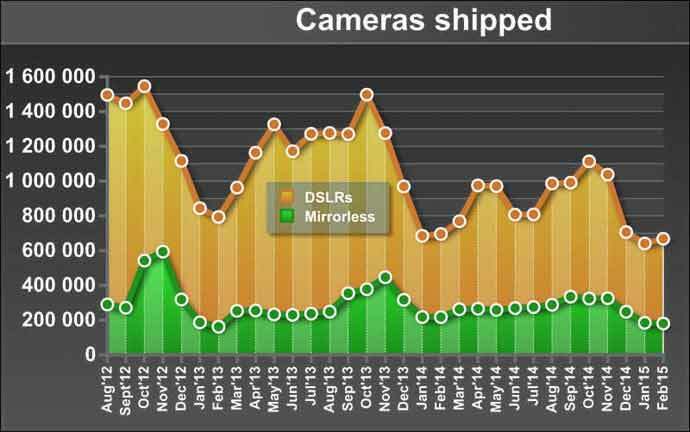 Signs of initial shipments of a few 5Ds cameras in the US. Perchance a bit of reaction to Sony’s 42MP? 10th Sony announce [DPR] the A7R II with an interesting 42MP full frame back illuminated sensor and 5-axis IS. I look forward to seeing if Sony has improved its data encoding in RAW files. 9th The latest camera numbers from CIPA show the usual spring jump in shipments (remember that these numbers are not sales). I look forward to hearing the likes of Thom Hogan pointing out some of the realities. Meanwhile, re-arranging the deckchairs in the camera business moves on. The curved sensor patent from Sony is suggested as making it to a real camera this year. One bit that looks less than likely is that it would work with existing lenses – well, not good ones with a flat field I’d suggest? 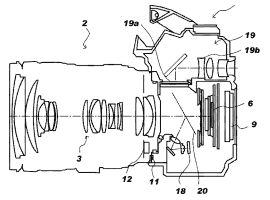 1st An interesting Canon patent reverses a fixed semitransparent mirror, to just divert light to a phase AF unit, whilst an EVF appears where the focus screen would be. [EG via Google xlt]. As with many patents (see the T/S lens with IS recently on the Lenses page), there are several different parts to the patent. the mirror, the improved AF at high frame rates and the EVF. 31st Canon rebates in the US are running until July 4th. Full list on the lens rumour page. I may not use Nikon kit, but I take no pleasure in their ongoing poor financial performance – Canon needs healthy competition. 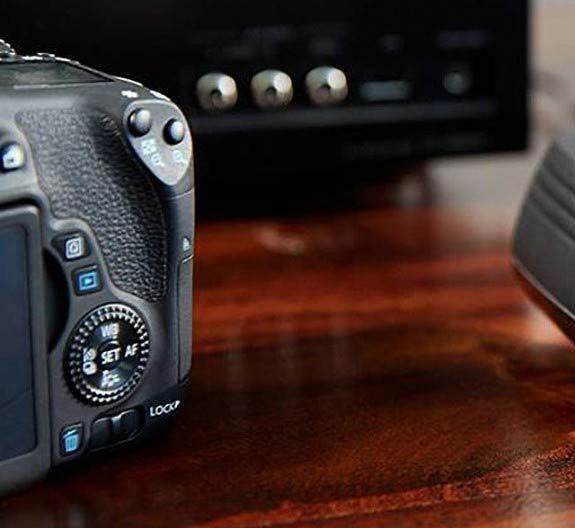 9th Canon produce a service advisory to address the T6i/s spotty sensor issue – no news on how 750D/760D models are affected. The predicted numbers for the whole year do suggest that some new products need to fill out the range. …although I’d expect a 6D2 to lag a 5D4 somewhat, since you want some full price 5D4 sales before tempting with a 6D2. 20th Looking for a new A2 printer? I’ve been testing Epson’s new P800 printer for a detailed review. 10th The C700x video specs have surfaced again, with an announcement for Monday? It will be interesting to see the size of the ‘late spring’ bump in DSLR shipments, and also how the suggestion I’ve seen that we have passed ‘peak mirrorless’ , holds out. 3rd Canon update DPP and EOS utility to support more lenses and cameras – details on our Canon Software page. A Sony patent [EG – Google xlt] looks at adding a lens over the top of a sensor to send light into a sensor chip perpendicular to the front surface. In this instance it shows a three layer foveon style sensor. The patent is a fairly general one, so could easily be adapted to increasing dynamic range (shorter exposures in bright areas). Since it’s using an electronic shutter, it could work just fine for video too. 24th Three days at a trade show – I’ve some ‘real work’ later today. 23rd Last day at the show today – I’ve seen some great photos. Thanks to everyone who’s stopped by. 20th The next three days I’ll be at The Photography Show at the NEC in the UK. I’d love to meet some of the rumour page regulars, so pop by and say hello? Q. Is there room for an EOS-1D level product in Canon’s lineup, with a higher resolution? A. This is something that is currently under consideration. Although aimed at the AF phase detection sensor design, it’s worth noting that by spliting the photo sensitive area into three vertical elements, at different depths, the response to light can be altered. The patent mentions using the second layer (32) as a monitor. This gives the capability of altering sensitivity, for example by turning off pixels before completely ‘full’, or adding layers one and three (31, 33) for increased sensitivity. In a DSLR, AF photo sensors are fed directly from the lens (usually wide open) so need to handle a much greater dynamic range than the main sensor, which has the benefits of a shutter and aperture setting. A few days ago Thom Hogan asked people to let him know what their biggest photographic ‘problems’ were. I was surprised (and to some extent pleased) by how many, that as a professional working photographer, I just didn’t see as real problems for me. However, it’s really useful to know the kinds of problems that are more widely faced when I’m looking for ideas for new articles on the site. Have a read – the article is as relevant to Canon users as it is any other make. BTW My own biggest issue technical annoyance with cameras is included in his list ;-) … anyone care to guess? Have a look at the interview on [IR] though – you do at least get the feeling that a bit of real info was communicated in the process of doing this one. Featuring a frame rate of read-out of 9.5fps, it’s is made possible by reading multiple pixels simultaneously at high speeds – a process Canon is calling ‘parallel signal processing’. The 120MP (2.2 µm pixel pitch) fits on a sensor of 29.2mm x 20.2mm, giving a 13280×9184 image. Lots of companies are looking for ways of making multilayer sensors. A patent from Nikon puts a layer of ‘all light’ or ‘W’ pixels underneath the normal R/G/B ones. Add the W pixel to the colour above and you get luminance for each pixel as well as the colours. Note the mirrorless and EVF designs. 10th Looking for a bigger printer? – The iPF5100 is currently down to just over £1000 [DPSB] in the UK. A bit overdue for an update, but still, a proper 17″ large format printer – see my review for more info. Also, with the flurry of announcements, it’s been time to update the Canon Timeline. I was told several times last year that Canon would have a very different model lineup by the end of 2015. Given the similarities I’ve included the 5Ds/5Dsr in the same row. I’ve also done this for the 750D/760D, since I suspect we’ll see each updated together? BTW I’ve added the same comments system that I use with my reviews (fixed after I broke the code a few weeks ago) to the 5Ds and 11-24mm pages, since I’m gettting both, and expect to be writing quite a few articles/reviews over time. 5th The ‘splitting’ of model types in the Canon DSLR range will be interesting to see from a product positioning point of view. I’m told (thanks) that it’s seen as a major benefit from ‘bringing home’ a lot of Canon’s manufacturing, and will become integral in producing cameras that are marketed more by what you can do with them. Whether this succeeds in a shrinking market or is in some ways ‘more of the same’ should be quite apparent in only a few years. Will any of the big manufacturers have the wherewithal to really break out of the incremental and evolutionary approach to new cameras? For Canon, we may see some signs of deeper changes at CP+, then again we may not. For over ten years, these pages have covered the massive developments in DSLRs and great new lenses – I hope that there’s still plenty of new stuff to wonder about in 5 years time? 28th A Canon/Sony ‘joint venture/patent swap’ rumour seems to be doing the rounds with respect to any upcoming high MP sensor [CR]. Was the March date a shipping date? However I note that at CR they suggest March, which seems reasonable, leaving CP+ for the new souped up 750D. I’m still unsure about there being two high MP bodies though? Just an FYI – I’ve now published the very long Epson SC-P600 printer review I’ve been working on for the last few weeks – hope it’s of interest. 22nd A bit of a lull in rumours of late. Given the proximity of CP+ it’s likely we’ll see something of a ‘real’ leak or two before too long. 15th If you make predictions, it’s essential to pay attention every so often to what you -didn’t- see. A good commentary about aspects of the photo industry from Thom Hogan is worth a read. I recall in about 2006 realising just how much quicker the decline of film had been than I’d expected back in 2003, when I decided to start as a digital only commercial photographer in 2004. Similarly to TH, I’d expected a fall off in DSLR sales over the last few years as new models and ‘improvements’ were just not enough to make people go out and buy new cameras, but I’d not expected the fall to be so sharp. I’ve been told by several sources that Canon ‘gets it’ and will be making some drastic changes in its product line-up over the next year, however I’m still left wondering just what a Japanese camera maker considers drastic? For me, it’s probably not the CS100 box below? I fully agree with Thom Hogan’s analysis about hardware and software, even if I feel no personal need for integrated workflows and wireless communications and am just fine with DCF. I do wonder if two high MP versions would be likely ? Personally I’m still hoping that we’ll see a 3D – mainly because it gives Canon a chance to make a ‘mini’ 1 series, without a bothersome (YMMV) dial on the top. However, I suspect that introducing a whole new body style gets ruled out for development cost reasons. If you have reviews of older Canon lenses that you’d like her to mention, please visit the site and let her know. Now that all the lenses are listed, we’re aiming to add plenty of new info, as we come across it. It’s got a flip out screen and a top LCD. Both the 700D and 70D date from 2013, but the 700D is the oldest technology with the long standing 18MP sensor. A top LCD for an xxxD (rebel) range camera? 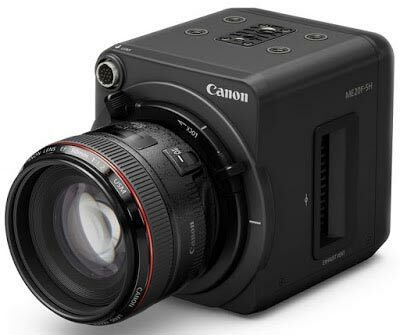 Nothing ‘high end’ at CES from Canon – the upcoming CP+ is more likely to see interesting products. If a really high MP camera appears in a 1 series body, I’d perhaps more see it as a 1D Xs? The 1D X was always a full frame 1D4 follow-on and not really aimed at traditional 1Ds users. Do Canon have a big sensor to revive the ‘Ds’ line? 1D X users, who are used to its high ISO and high frame rate are not really going to take kindly to either being reduced. Several years ago we were told that Canon was looking at ways of binning the output of high MP sensors to offer a choice of resolution vs sensitivity & speed. To get this to work takes a lot of pixels in the un-binned sensor. Canon have said that they can make the DSLR smaller and lighter – this might well appear in the successor to the 100D and other xxxD models, when they get versions of the new 20MP APS-C sensor. 1st Happy new year folks! “- He believes time will come when Mirrorless will outsell DSLR. But DSLR will always exist as a niche product. – We receive many request to make a Full Frame Foveon. And we are aware the tendency now is to make larger sensors and with even more Megapixels. – Sigma has no plan to make an interchangeable mirrorless system camera yet.